The Indonesian army has launched a massive offensive against separatist rebels in Aceh after President Megawati Sukarnoputri declared the province under martial law. Fighter jets fired rockets at Free Aceh Movement (Gam) rebels based about 20 kilometres (12 miles) east of the provincial capital of Banda Aceh, as scores of troops began parachuting in. "Their job is to destroy the armed forces of Gam through to their roots," Indonesian military chief Endriartono Sutarto said. It is a dramatic return to violence for a province where frequent clashes between separatists and the Indonesian army over the last 26 years have left at least 10,000 people dead. It also appears to mark the collapse of a landmark peace deal, signed last December, that allowed the rebels limited autonomy and which international observers had hoped would spell an end to the violence. But the accord foundered after weekend talks in Tokyo as Jakarta blamed the Gam rebels for refusing to give up their demand for independence. The BBC's Patricia Nunan says that in some ways it appears that this was inevitable - none of the peace deal's other goals, such as holding local elections and a demilitarisation of Aceh were ever addressed in the talks. The military offensive began almost immediately after the imposition of martial law (at 1700 GMT on Sunday). 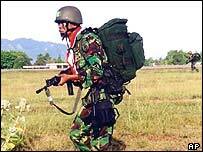 More than 500 soldiers parachuted into an airfield in western Aceh early on Monday as the media looked on. "The offensive has begun," said Major Erwin Sujono in Banda Aceh, adding that 15 warships had moved in close to the northern town of Lhokseumawe, where many of the rebels are based. There appeared to be little resistance. A BBC correspondent in Aceh, Tim Johnston, said there were also signs that the offensive might be simultaneously following a less publicised path. Villagers near the garrison town of Lhokseumawe told the BBC that troops had surrounded the house of a farmer before dawn on Monday, just four hours after the president had declared martial law. The villagers said the man had been shot before being taken away. They have been unable to find out if he is still alive. In another development, Indonesian police are reported to have re-arrested five senior rebel delegates, who were freed on Saturday before the talks started. Indonesian military chief General Endriartono Sutarto said the aim of the early operations was to eliminate the key Gam leadership sites, while the long-term goal was to reduce Gam to its "smallest unit" within six months. 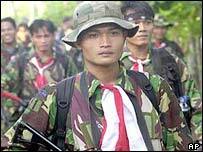 Our correspondent says that local people are very frightened by the Indonesian army's "unenviable reputation for violence". Trader Tengku Muhammad, 47, told Reuters news agency: "Everyone in Aceh is in fear. I have resigned myself to God." Another resident, named Mawami, was terrified the civilians would get caught up in the fighting. "The rebels will hide behind the civilians, and how will the army tell the difference?" he asked. Rebel forces are estimated at 3,000-5,000 fighters. Rebel leader Mahmood Malik said he believed the Indonesian Government had had no intention of compromising at the weekend talks - it was "looking for a way to declare war". "They asked us to abandon our independence. They asked us to surrender. "We will oppose the onslaught. We will fight for independence," he warned. The mainly-Muslim province enjoyed a long period as an independent sultanate before it was incorporated into the Republic of Indonesia in 1949. Resentment against Jakarta's rule has been fuelled by perceived abuses by the Indonesian military, and a feeling that the government has not shared the proceeds from the province's rich natural resources with the local population. Indonesia also faces demands for independence among several provinces, where separatists have been encouraged by East Timor's 1999 success in breaking away after 25 years of occupation. President Megawati is a strong proponent of a united Indonesia, and she has made action against separatist guerrillas in Aceh a priority. 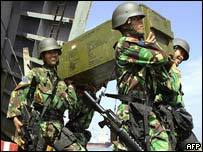 "The offensive could become Indonesia's largest military operation since it invaded East Timor in 1975"